High Density Poly Urethane Foam Cryogenic Pipe Supports (HD PUF) are utilised on pipe work that requires thermal insulation to minimise loss of process energy. Eg Liquefied Natural Gas (LNG) Production, Refining, Storage and Transport Plant. Binder is a specialist designer and manufacturer of HF PUF supports with products installed across most global LNG regions. All Binder HD PUF cradles are manufactured from “NON-CFC” polyurethanes which are classified as self-extinguishing with a 90% retention of weight when tested in accordance with BS4735 and ASTM D-3014 standards respectively. 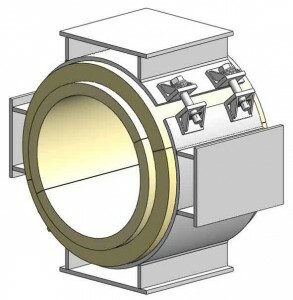 The Standard Binder HD PUF pipe support is a single/multi-layer (depending on pipe size) monolithically moulded high density polyurethane cradle in two 180º sections without longitudinal or circumferential seams. Where the line insulation thickness exceeds 60mm a step is provided at each end to prevent a direct vapour path to the insulated surface. All Binder HD PUF support cradles are moulded under rigidly controlled temperature and humidity conditions and over packing is used to ensure complete filling of the mould and to produce sharp square corners for “no gap” joining to the line insulation. Binder HD PUF supports are clamped to the pipe. Specific Disc Spring washer configurations and bolts are used to accommodate the shrinkage of the pipe during plant operation. 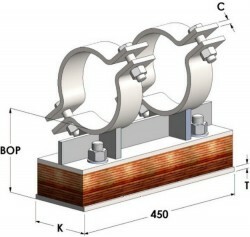 Binder supports are sized to match the outside diameter of the mating line insulation. 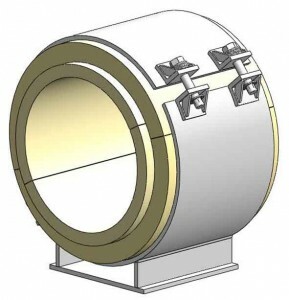 Standard Binder HD PUF supports are sized in accordance with ASTM C-585. Binder HD PUF supports are shipped with a factory installed weather/vapour barrier mastic layer to all exposed surface of the PUF. The weather/vapour barrier mastic is fire retarded and has a vapour permeance of not more than 0.02 perms. Full 360º Bearing plate assemblies are manufactured with formed ears or welded lugs to accept bolts and nuts. All HD PUF supports are individually wrapped and sealed in moisture proof plastic packaging and crated to avoid mechanical damage to PUF and steel components. 1. 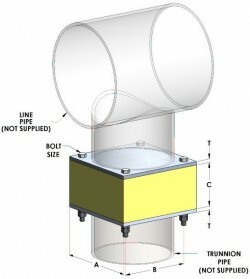 The BG600 standard HD PUF Shoe is fitted with Disc Spring Washers on each bolt which ensures that the cradle is adequately clamped even after shrinkage has occurred due to the cryogenic operating temperature of the supported pipe. 2. The clamping force is calculated so that the cradle will not rotate or slip axially on the pipe as the base experiences frictional resistance when the shoe is free to slide (un-guided) on the support structure. 3. The frictional resistance is a result of the Vertical Design Load of the pipe and the shoe’s Self Weight. 4. 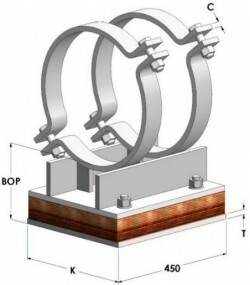 A PTFE Slide Plate is recommended for larger diameter supports to reduce the sliding resistance and hence the clamping force required to prevent rotation. 1. The BG601 HD PUF Shoe is similar to the BG600 except it has an extra base attached to the top cradle to prevent the pipe lifting up during operation. 2. For small up-lift forces, the BG600 can be used instead with hold-downs acting at the shoe base; however, this may result in higher clamping forces to prevent rotational slippage and will require calculations to be carried out as needed. 1. The BG602 HD PUF Shoe is similar to the BG600 except it has guide bases attached to each side to resist large lateral forces. 2. 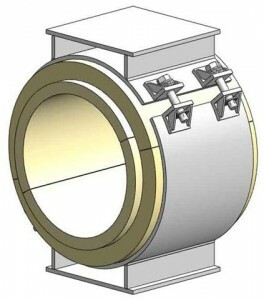 The effect of the guide bases mounted at the pipe centreline level is such that the shoe can handle large lateral loading without the need for high clamping forces to resist slippage. 3. For small lateral forces, the BG600 can be used instead with guides acting at the shoe base; however, this will result in higher clamping forces to prevent rotational slippage and will require calculations to be carried out as needed. 1. The BG603 HD PUF Shoe has both the upper base of the BG601 and the guide bases of the BG602 to resist large up-lift and lateral forces. 2. As with the BG602, effect of the guide bases mounted at the pipe centreline level is such that the shoe can handle large lateral loading without the need for high clamping forces to resist slipping. 3. For small lateral and up-lift forces, the BG600 can be used with hold-down guides acting at the shoe base; however, this will result in higher clamping forces to prevent rotational slippage and will require calculations to be carried out as needed. Binder provides Cold Shoes for uninsulated pipe. Insulated Block is a compressed laminated wood with marine varnish coating. Insulating wood is typically Permali wood with alternatives available including DuroStone or Micarta. Pipe shoes are available with lateral and vertical axial restraints. Copyright © 2019 Binder Group.